We slip back in time on a narrow gravel road that twists and turns into the Great Smoky Mountains National Park. North Carolina’s Cataloochee Valley lies ahead. Thick forest opens to wide green meadows and a young brown bear runs across the road and into the trees beyond. Later in the day we will see elk here. Once one of the largest settlements in the Smokies, Cataloochee is no longer home to humans. A display at the Visitor’s Center tells the story. Families from nearby communities migrated here in the early 1800’s. The Caldwells, Palmers and Woodys raised apples, tobacco and other market crops. Tourists discovered the beautiful valley and its abundant game and fish, and the farmers seized the opportunity to provide the visitors with wilderness guides, food and lodging. 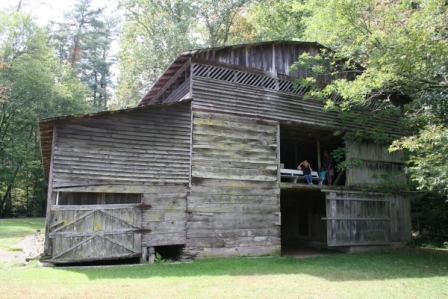 The Park Service has preserved several abandoned homes and barns and they are open daily. The Palmers’ dogtrot house serves as the Visitor’s Center, and the hayloft in the weathered Palmer barn provides the perfect vantage point for a bird’s eye view of the lush valley below. barn lie a few more miles down the road, past the campground and Palmer Chapel. Broad shingled gables, a wraparound porch and an open door welcome visitors. Sunlight streams through large windows, highlighting the many varieties of interior paneling in the house. Built in 1906, this was a modern structure, very different from the family’s previous home in a log cabin. Up the steep stairway the eerily deserted bedrooms are plastered with newspaper and magazine pages, perhaps for decoration, but almost certainly as insulation against chill winter winds. Rough Fork Trail begins just past the Caldwell property. An easy hike through the woods, the trail leads to the sprawling Woody farmhouse on the hill and its picturesque spring house. 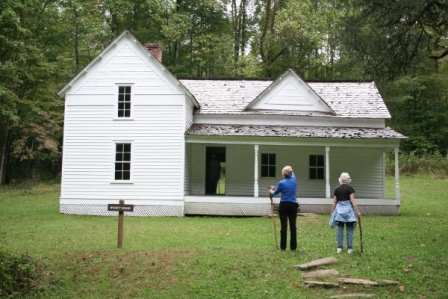 Built around the family’s original log cabin, the house features a bedroom called the “Old Soldier’s Room” where all of the Woodys’ eight children slept. The National Park Service reintroduced elk to the Great Smoky Mountains in 2001, and a herd has established itself in Cataloochee. In the early evening we spot a bull guarding his harem of about 30 cows. Further on, a magnificent bull with a full rack of antlers enjoys a solitary supper in the tall grass. Excited shutterbugs record the scene, while volunteers from the Elk Bugle Corp entertain the children with a display of shed antlers. It’s dusk. The elk drift away into the trees, and it’s time to head back down that winding gravel road. We descend through the darkening forest as the Virginia Squires sing “The Late Night Call of the Whippoorwill” on the car radio. Legend has it that the settlers displaced by the park left with tears in their eyes. We understand. We don’t want to leave Cataloochee either. Take I-40 to the Highway 276 exit toward Maggie Valley. Immediately off the off-ramp, Cove Creek Road will be on your right. 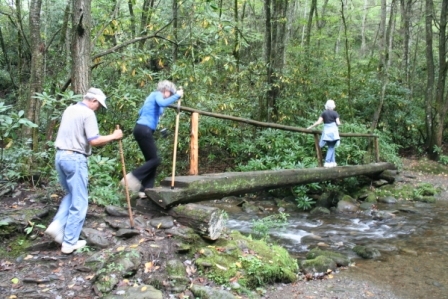 Take Cove Creek Road 13 miles to Cataloochee Valley.